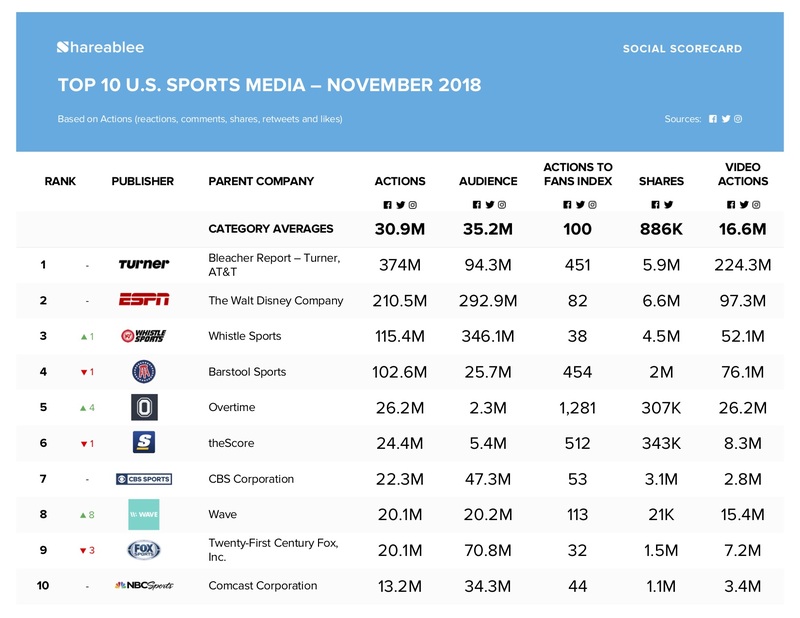 NEW YORK, December 7, 2018	(Newswire.com) - Shareablee Inc., the global leader in audience-based social media measurement, today released their November ranking of the most socially engaged sports media brands across the United States. 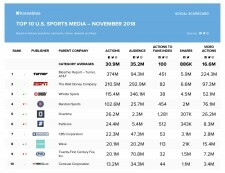 Sports media brands rose 14.3 percent overall and represented a total of 990.3 million actions (post-level reactions, shares, comments, retweets, and likes) across Facebook, Twitter, and Instagram in over the last month. The Bleacher Report – Turner Sports Network led the ranking with 373.9 million actions, followed by ESPN (210.5 million actions), Whistle Sports (115.4 million actions), Barstool Sports (102.6 million actions), and Overtime (26.2 million actions). ESPN had the highest engagement on their branded content with 243.1 actions, partnering with Exxon, Coca-Cola and Dove Men+ Care, followed by Turner Sports and CBS Sports. ESPN ranked first in the video category with 409.4 million views last month. Whistle Sports came in second with 284.8 million while Turner Sports came in third with 127.6 million. The fastest growing U.S. Sports TV Network in November was Overtime (ranked fifth), with 58 percent growth in overall engagement since last month and 989 percent growth since November of 2017.